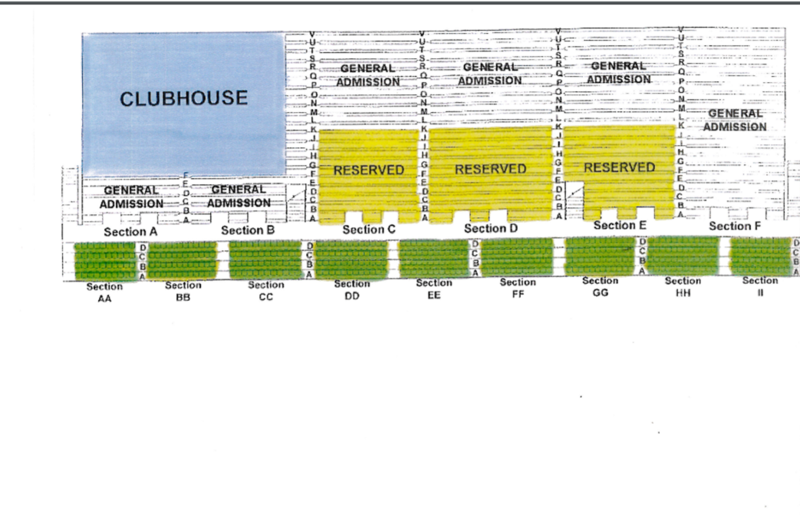 BE SURE TO CHECK OUT OUR SEATING CHART TO DETERMINE WHAT TYPE OF TICKETS TO ORDER. FOR SEAT AVAILABILITY OR TO PLACE AN ORDER CLICK ON the ticket located at the top of our website, STOP INTO OUR OFFICE OR GIVE US A CALL AT 402-462-3247. Below you will find a seating chart for the grandstands. Tickets are sold as General Admission, Reserved, Stadium and Clubhouse. Please remember that the chutes are located at the Northeast corner of the arena closest to Stadium Seating II. Clubhouse: This is the blue area on the map above. The Clubhouse is a glassed-in room in the upper South West corner of the Grandstands. It is climatically controlled and all sound is brought in by our audio specialists. With Clubhouse seating you are assigned a seat at a specifically numbered table. The Clubhouse also has a fully-stocked bar and waitresses that will serve you at your table for your convenience. Pricing for the Clubhouse is $5.00 per seat along with a General Admission, Reserved or Stadium Ticket. This pricing is for everyone ages 6 and up. Five and under are free as long as they sit on your lap.